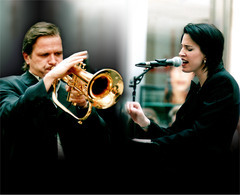 The American vocalist and pianist Ellen Marquart and German jazz trumpet player Bernd Marquart have been making music together since 1991. Ellen´s captivating voice and expressive piano style find their perfect counterpart in Bernd´s virtuoso improvisations. Contra bass and drums complete the Marquarts´ quartet JAZZLIFE, adding a must-have groove to original compositions and newly interpreted American songs and Latin jazz. Ellen and Bernd Marquart´s newest project is a program of original compositions arranged for their quartet JAZZLIFE and a twelve-piece orchestra. The string arrangements, recorded on the Marquart´s recently released CD "A Day With You", were written by the internationally renowned pianist and composer Kuno Schmid, who also conducts the orchester during live performances. There is a tangible interaction between these individual musicians that join to form this exciting group and make its´ one-of-a-kind sound. Whether in duo, trio, quartet, or as jazz orchestra, JAZZLIFE radiates a sense of harmony and mutual passion in performances that inspire its audiences with that irresistible drive and touch of elegance that has been handed down from jazz generation to jazz generation. Products or Services: JAZZLIFE may be booked for festivals, jazz clubs, and special events.